The Scots army is made up of mostly spears, a few warband, some psiloi skirmishers, a light horse and a cavalry element, and make an interesting opponent for the vikings. Not as tough as the Welsh, but certainly much more slippery. Steinthor, worried about his hold over his horde after their loss in Wales put his mind to pinning down the spears of the enemy and driving the Scots out of their castles! This battle is one of the many that makes up part of the Raid! Pillage! Loot! viking DBA campaign! 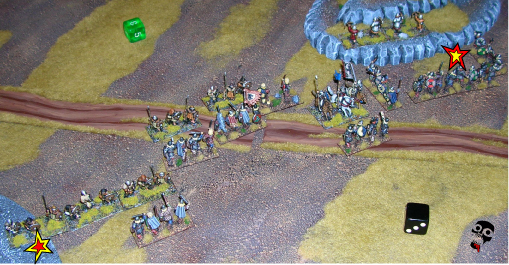 The armies take to the field. 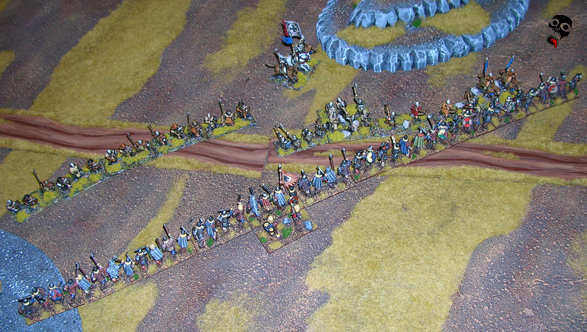 Steinthor lines his men up in the usual shieldwall. 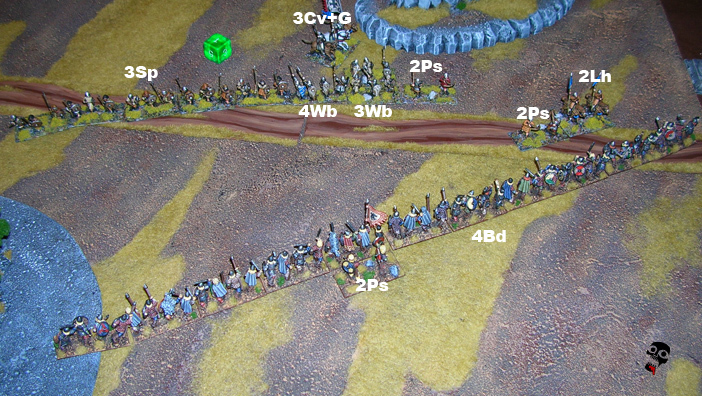 This time he wanted to spread his line out to the edge of the board to make sure that those pesky skirmishers (2Ps) didn't pin his army in place again! 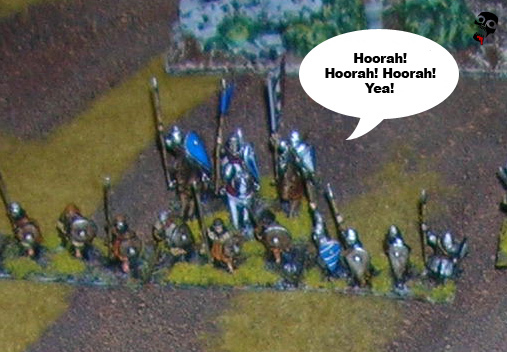 Fionnlagh roused his troops with his traditional warcry! Hoorah! Hoorah! Hoorah! Yea! The swords of a thousand men rang out on the hill in response! They were ready for battle! Unfortunately for Fionnlagh, he knew his political strength was teetering. After recently coming to power by killing one of his relatives, he needed to win this battle to solidify his hold over the kingdom and hopefully put an end to those pesky voices in his head! That is why he chose to make battle here! Not too far up this road was the town most well known for the fierceness of its in people defending it! Those fierce warriors made up the right flank of Fionnlagh's army (right on the picture at the top). 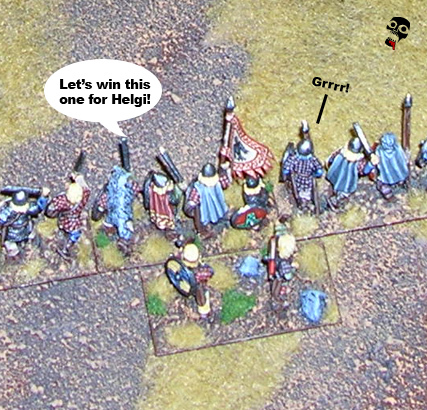 If nobody else helds, those spearmen would! Steinthor invoked the name of one of his most beloved warriors who died at the hands of the Welsh. The vikings envied Helgi, as he was surely feasting in Valhalla even now! Their fervor to fight increased in pitch as they screamed war cries through the sky! 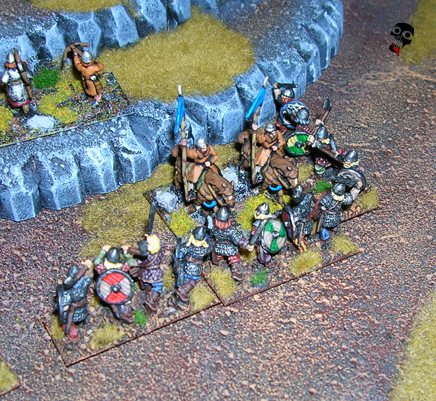 As the fast-moving Scottish cavalry sped up and down the viking line, Steinthor spread out his warriors. He stood content as his warriors expanded, cutting off any chance that the light horse would have at getting behind his lines. There he ordered his army to advance on the advancing Scottish! Hoorah! Hoorah! could be heard as the lines closed! Blades, spears, and javelins clashed as the lines begin to meet, but none were slain. 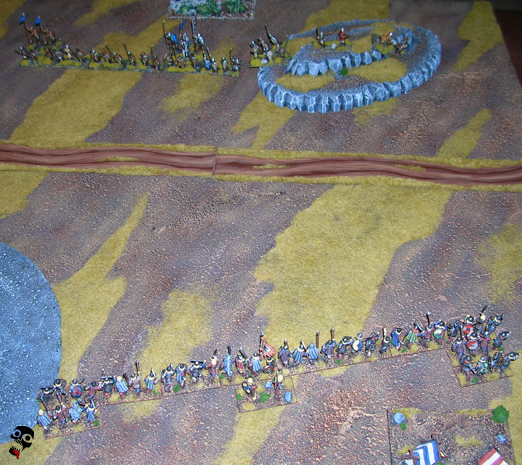 The skirmishers and light horse on the right flank bobbed back and forth against the viking line, but neither the vikings or the Scots gained the upper hand there! When the lines came together, much blood was shed! The elite troops of Fionnlagh died a fighting death in the center, which forced Fionnlagh himself to rush into the battle and avenge their untimely demise! Meanwhile, the battle on the left flank did not go well. The tough villagers had managed to hold and even destroy one of the viking units! With such a close match, the battle hung on the brink! One chance to end it all, the viking horde must finally pin down and destroy the skirmishing horse riders. Arrows flew, spears were thrust, javelins thrown, and axes swung... But who would come out victorious? Another great game this was. The battle was close, well faught, and interesting. What was also great about this game is the discussion that was had over it. The idea that political leaders sent people to die for very little added a flavour to the game that was great. The idea that some people would join the battle for glory, some because they had no choice, and some to defend their families and livelihood, while some leader would take all of their sacrifices and claim them as his own! Anyway, great battle!